Mau ke Jerman Gratis? Mau nonton LIVE Berlin Fashion Week di Jerman? Ikutan Kompetisi JERIN aja! Perancang mode Indonesia yang pertama! 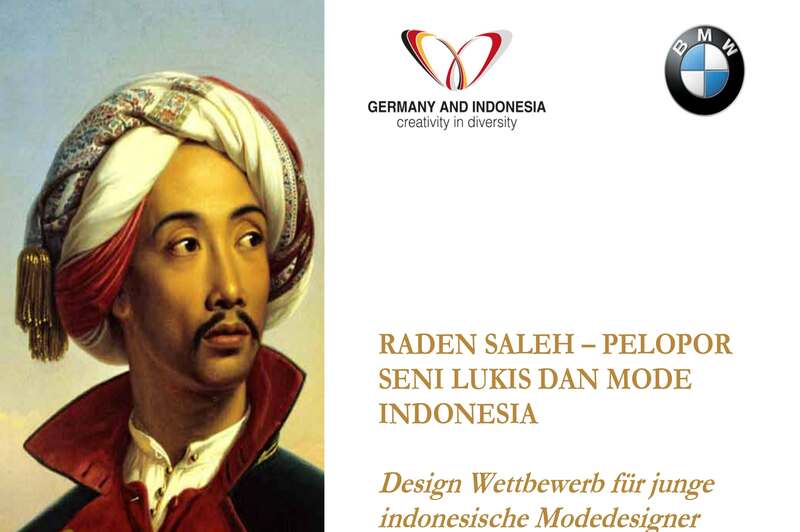 Dalam rangka pameran monografis pertama sang pelukis yang akan diselenggarakan di tanah airnya Indonesia pada bulan Juni 2012, Goethe-Institut bersama para mitranya mengundang perancang muda Indonesia untuk mengirimkan rancangan busana dengan moto “Raden Saleh – Pelopor Seni Lukis dan Mode Indonesia” kepada juri, paling lambat tanggal 08.04.2012. Pemenang utama dari ke-10 finalis akan mendapatkan kesempatan untuk menghadiri Berlin Fashion Week di Jerman! Daftar pendek: Ke-10 penyertaan terbaik akan memperoleh kesempatan dan pendanaan untuk merealisasikan dan menyajikan kreasi masing-masing di Galeri Nasional di hadapan audiens terpilih tokoh-tokoh VIP dari dunia mode dan budaya Indonesia. Silakan hubungi radensaleh@jerin.or.id untuk penjelasan lebih mendetail mengenai persyaratan keikutsertaan. EXTENDED til March 31st 2012! The JERIN – Logo is inspired by the butterfly, draped in the Indonesian and German national colors. The logo reflects the philosophy of the butterfly effect: a small change in one place can have large effects elsewhere. In Indonesian mythology, the arrival of the butterfly symbolizes a joyful event. The butterfly is dynamic and lively – exactly what we expect from JERIN ! 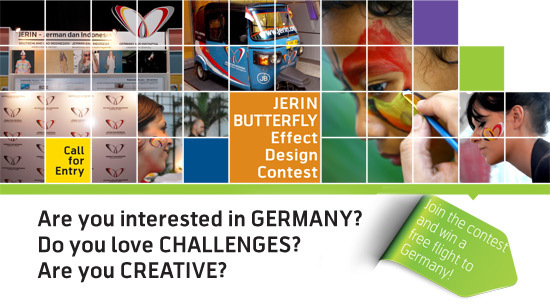 Enroll to the JERIN BUTTERFLY Effect Design Contest and learn more about Germany and Indonesia. The winner is entitled to a free return ticket to Germany. Show us how creative you really are and what you can do to show us your diversity! Design your own JERIN BUTTERFLY in the national colors of Indonesia and Germany. Paint it! Draw it! Perform it! Use crazy material for it! Make clothes out of it! Draw it on anything you can find! Be the butterfly yourself! The more creative the better! We are looking forward to some impressive new interpretations! Use your version of JERIN BUTTERFLY as profile picture on Facebook! Post your version of JERIN BUTTERFLY on JERIN Facebook page and on your Twitter account! Get at least 50 of your friends to “Like” the JERIN Facebook page! Don’t forget to ask your friends to post a comment under your picture on our wall. This way we can track how many sign-ups you’ve achieved. Complete as many phases as you can. The winner will be selected by a jury from JERIN committee based on the accomplishment of the most phases and the most creative interpretation of the JERIN BUTTERFLY. Email us at info@jerin.or.id the summary of all the phase you have accomplished accompanied with the registration form BEFORE March 31, 2012 ! There will only be ONE winner for the flight to Germany. All participants who have accomplished all phases, can redeem a gift at one of our JERIN Events. Your Facebook wall and Twitter page must be public so that we can confirm contest entries and are able to contact you. Tapi ketemu ama anggota timnas Jerman, bukan tentang fashion…. wah…, informasi yang menarik ini; makasih banyak ya, Mbak.